Rabbi Abraham Cooper of the Simon Wiesenthal Center testified in favor of an Israel-centric definition before the House Judiciary Committee, Nov. 7, 2017. Jewish and pro-Israel leaders exchanged heated remarks at a congressional hearing on how to define anti-Semitism. Tuesday’s hearing of the House Judiciary Committee took up a bill that would, among other things, define as anti-Semitism language that “demonizes” Israel. Of the nine witnesses who addressed the committee, five said the language was necessary to stem anti-Semitism on campuses. Four argued it infringes on freedom of speech. The witnesses at times directly addressed one another, violating congressional protocol. Exchanging barbs, each side questioned the bona fides of the other in defining anti-Semitism. In a bizarre twist, the co-authors of the language that the bill would codify argued opposing viewpoints. Lawmakers, who also bickered at times, marveled at the Jewish family food fight they were witnessing. “It’s like throwing a ball and having a scrum and seeing who wins,” said Rep. Doug Collins, R-Ga.
At issue is the Anti-Semitism Awareness Act, which would codify the State Department’s definition of anti-Semitism. [Hannah Rosenthal was responsible for adopting this, video of Rosenthal here.] The proposed addition to federal anti-discrimination statutes would apply to Title VI of the 1964 Civil Rights Act, which addresses institutions, including universities, that receive federal funding. A version has passed in the Senate. Sen. Lindsey Graham, (R-SC), and Sen. Michael F. Bennet (D-CO). Several Jewish groups have filed Title VI complaints on behalf of Jewish students who said they faced anti-Semitic harassment and discrimination because of their support for Israel, or were subject to anti-Israel invective that advocates said echoed “classic” anti-Semitism. 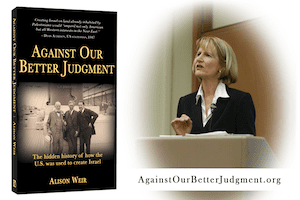 Advocating for the proposed language were top officials of the Anti-Defamation League, the American Jewish Committee, the Simon Wiesenthal Center and Christians United for Israel [founding executive director is David Brog, listed in the “Forward 50” most influential Jews in America], as well as Paul Clement, a former U.S. solicitor general. Opposing were two Jewish studies professors, the director of PEN America — a speech freedom umbrella — and Kenneth Stern, the head of an outfit that combats anti-Semitism. Stern, who drafted the language in question when he worked for the American Jewish Committee in 2004, opposes codifying the language into law, although he still endorses the language for its intended use — as a means for diplomats to identify anti-Semitism. In his testimony Stern, who directs the Justus & Karin Rosenberg Foundation, said the tough standards he would apply to a speech at the United Nations by Iran’s president should not apply to college freshmen. He said it would be especially cruel to young Jews still testing their boundaries within the community. “Whether or not you can be an 18-year-old anti-Zionist and within the [Jewish] community is not a debate Congress should decide,” he said. Proponents said the bill would not inhibit speech because the definition would only be applied when assessing whether an act banned under Title VI — violence or a bid to shut off speech — was anti-Semitic, and not to anti-Semitic speech in and of itself. “It wouldn’t raise First Amendment problems, it would only be triggered by harassment,” Clement said. That, Stern replied, was “disingenuous” — a federal statute would naturally inhibit speech. “When you prioritize a certain definition, it has the weight of having Congress behind it,” he said. Barry Trachtenberg, a Jewish studies professor at Wake Forest University in North Carolina, seemed to accuse proponents of the legislation of bad faith. “They are part of a persistent campaign to thwart scholarship, debate and activism critical of Israel,” he said. The Simon Wiesenthal Center’s Rabbi Abraham Cooper and the ADL’s Jonathan Greenblatt fired shots at Trachtenberg and at Pamela Nadell, the president of the Association for Jewish Studies, saying that academics were not in the trenches. Cooper chided the committee for inviting them. “It’s like inviting people from the Flat Earth Society to a hearing about NASA,” he said. Greenblatt suggested they were ensconced in an ivory tower. Cooper seemed visibly uncomfortable crowded next to Trachtenberg at the witness table, who kept staring at him. Cooper kept emphasizing that the Jewish leadership in its entirety backed the bill, seeming to sideline Stern’s organizational affiliation. At one point Cooper’s insistence that the entire Jewish community backed the bill drew a correction from Rep. Jerrold Nadler, D-N.Y., who produced a letter from J Street U, the liberal Middle Eastern lobby’s campus affiliate, opposing the bill. Some lawmakers vigorously backed the bill. Rep. Ted Deutch, D-Fla., the Jewish lawmaker who wrote the bill with Rep. Pete Roskam, R-Ill., was infuriated by Stern’s claim that the bill would victimize freshmen searching for answers. “Saying this is an effort to go after Jewish anti-Zionists is the reddest of red herrings,” he said. Should Congress Decide Who’s An Anti-Semite? Barry Trachtenberg, the director of Wake Forest College’s Jewish studies program, wanted members of Congress to know that statements equating Israel’s actions to Nazi Germany’s are not necessarily anti-Semitic. The topic at hand during a Tuesday meeting of the congressional committee was legislation that would formally identify such speech as a factor in defining anti-Semitism. And the definition could be used, among other things, for investigating alleged civil rights violations on college campuses. But Trachtenberg, who has supported an academic boycott of Israel due to its policies towards the Palestinians, reminded the lawmakers that Presidents George H.W. Bush and George W. Bush had each compared Iraqi leader Saddam Hussein to Hitler before invading his country. And other countries have also had this comparison thrown at them. That view got a lot of pushback from leaders of three Jewish organizations (and one evangelical Christian organization) who also testified at the Judiciary Committee’s hearing on college campus anti-Semitism. All of them strongly supported the proposed legislation, known as the Anti-Semitism Awareness Act, which would incorporate some types of anti-Israel speech in its definition of anti-Semitism. But on the same panel sat three Jewish scholars and academics, including Trachtenberg, who staunchly opposed the legislation as a potential threat to free speech and free inquiry, citing their own experiences on college campuses. The chasm separating the two groups, as reflected in their prepared remarks, marked one of the most striking features of the hearing. “Enactment of the ASAA will help ensure that [federal] investigations of future complaints…will be informed by a definition of anti-Semitism that includes all current manifestations,” Jonathan Greenblatt, CEO and national director of the Anti-Defamation League, told the lawmakers. But Susan Nossel, the executive director of PEN America, an association of writers, editors and translators devoted to defending free expression, sharply criticized the ASAA. “It is a mistake,” she said, “to adopt a blanket rule that would treat broad categories of criticism of Israel’s government or its policies as anti-Semitism,” as outlined in the act. • Using symbols and images associated with classic anti-Semitism to characterize Israel or Israelis. • Comparing Israel’s contemporary policies to those of the Nazis. • Applying double standards when judging Israel’s conduct compared to other democratic countries. • Denying the Jewish people their right to self-determination, and denying Israel the right to exist. Criticism of Israel “similar to that leveled against any other country cannot be regarded as anti-Semitic,” the definition adds. In addition, under the civil rights law itself, mere incidents or episodes of this sort are insufficient for finding a school in violation of federal civil rights law; the school must harbor a “hostile environment so severe, pervasive, or persistent” that it interferes with some students’ ability learn and take part in campus activities. Whether U.S. campuses commonly harbor such environments was itself in sharp dispute among the Jewish panelists. Kenneth Stern, a former official of the American Jewish Committee who helped write an early version of the definition of anti-Semitism for monitoring purposes—but opposes its use as a tool for civil rights enforcement—said, “One campus with anti-Semitism is too many.” Stern, who is today executive director of the Justus & Karin Rosenberg Foundation, which combats hate and anti-Semitism, described one campus he’d visited, where he found an atmosphere of anti-Semitism so pervasive that some students were afraid to meet with him. Greenblatt, in contrast, described campuses as increasingly a target for both anti-Semitic right-wing white nationalists and left-wing pro-Palestinian activists who attack Israel in ways that target Jewish students, not just Israeli policies. Greenblatt and Abraham Cooper, associate dean of the Simon Wiesenthal Center, recited a litany of examples of such campus anti-Semitic episodes across the country. In some, administration officials had responded strongly, Greenblatt said; in others, they had not. But Pamela Nadell, president of the Association for Jewish Studies and a professor at American University, stressed the distinction between incidents of anti-Semitism and pervasiveness. Cooper intimated that anti-Zionism, by itself, was evidence of anti-Semitism, though many who hold that position, including Jews, claim to be motivated by their objections to privileging Jews in various ways as a group in a state that is more than 21% non-Jewish; many also cite the additional 2.5 million Palestinians under military occupation in the West Bank, which Israel’s current government claims as part of its Zionist vision. Some opponents of this vision instead advocate a binational state as a means of resolving the conflict. For Stern, the addition of that phrase, and its potential for violating free speech seemed all but inevitable if such legislation passed. Both Satmar Hasidim and some left-wing Jews have objections to Zionism, he told the lawmakers, for varied theological, ethical or political reasons. Larry Cohler-Esses is the Forward’s senior investigative writer. He joined the staff in December 2008. Previously, he served as Editor-at-Large for the Jewish Week, an investigative reporter for the New York Daily News, and as a staff writer for the Jewish Week as well as the Washington Jewish Week. Larry has written extensively on the Arab-Jewish relations both in the United States and the Middle East. His articles have won awards from the Society for Professional Journalists, the Religious Newswriters Association, the New York Press Association and the Rockower Awards for Jewish Journalism, among others. Larry Cohler-Esses can be reached at cohleresses@forward.com.